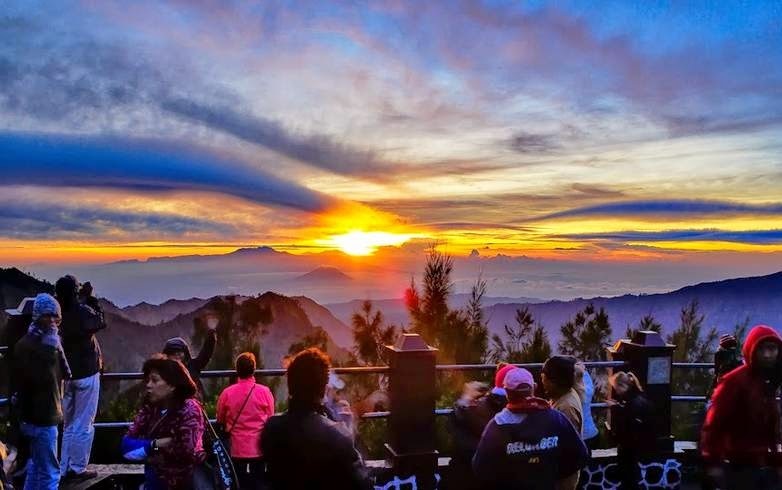 Mount Bromo Midnight Tour Package, is the perfect choice for you who do not have much time for a long vacation. In just one day, or rather one night only you can enjoy precious vacation time. Pickup will be starting from Surabaya or Malang area where you have specified as in airport or station and can also at the Hotel where you stay. Our team will do a pick-up at 19:00 and will arrive at your location at around 22:00 to 23:00 and will go directly to Bromo tourist attraction. Arriving at Mount Bromo Cemoro Lawang area around 02:00 am, participants can take a break and then at 3:00 a.m. to 03:30 participants will be delivered by Jeep to Bromo Tour will start from the ascent to the summit to see Bromo Sunrise / Sunrise at Mount Bromo is beautiful and enchanting. Once finished viewing the sunrise Mount Bromo, Jeep will lead the participants to get to Padang Savanah Bromo or also commonly called by the name of Savana Teletubies. Finish enjoy the beauty Savanah Bromo, Jeep will take participants to the Desert of Mount Bromo, which is also commonly referred to by the name Whispering Sand. Then the final destination is the crater of Mount Bromo, here participants can climb to the top of Mount Bromo. The crater of Mount Bromo is the final destination of the tour participants shared jeep Bromo. Jeep destination Bromo has 2 different options with different prices and participants can choose their own, ie 2 goals to Penanjakan and directly to the Bromo crater, or 4 goals: first will go Climbing - Padang Savanah - Whispering Sand - Bromo crater. Recommendations from Rifa Tour destination is selected 4 Mount Bromo tourist sites in order to enjoy all the attractions in Mount Bromo is more complete. Once the tour was finished, Bromo Jeep will deliver the participants returned to the area Cemoro Lawang and our team has been waiting for the arrival of the participants of the tour. Then our team will take the participants to return to the airport / station in Surabaya / Malang, in accordance with the request of participants of the tour. And Bromo Midnight Tour has been completed. We have lots of offers for Midnight Tour Bromo package includes what is included and what is not included. But the recommendation of our Rifa Tour is All Inclusive package which includes all the necessities for a tour to Bromo and attendees and of course does not include the personal needs of the participants. 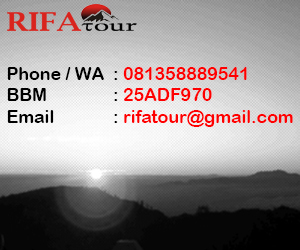 Enjoy your vacation time with us to Mount Bromo Rifa Tour which offers low price and quality. Further information on the price that we offer in accordance with the itinerary or trip tour route as written above can contact us directly through the contact we provide.